My friend, an avid card player, asked me to make a Michigan Rummy turntable for him. Michigan Rummy is a card game played with chips. I really don’t know how to play, but I said I’d make him one, based on what I could gather from plastic “trays” found on the internet; some are just flat boards or sheets. He wanted something that could be spun from player to player for easier access. It’s 16” across, and 1 1/2” thick, cherry top half, maple bottom half, with a lazy susan. To give it a more professional look, I made water slide decals for the eight different card pools and the “kitty” in the middle cup. You can buy inkjet decal sheets at modeling stores; they have clear sheets, which I used here. You then give that sheet a thin spray of poly, and let it completely dry; two coats might be a good idea. Once that is dry, you cut close to the decal, wet it in a bowl of water for a few seconds, then place it where you want to transfer it to. after a minute or so, the glue has softened up, and you very gently slide the decal off it’s backing (I used a soft detail brush) and into place. Gently smooth out the bubbles, pat gently dry with a paper towel. There is a little bit of a trick to it, it’s delicate. Finished simply with several coats of water-based satin poly. 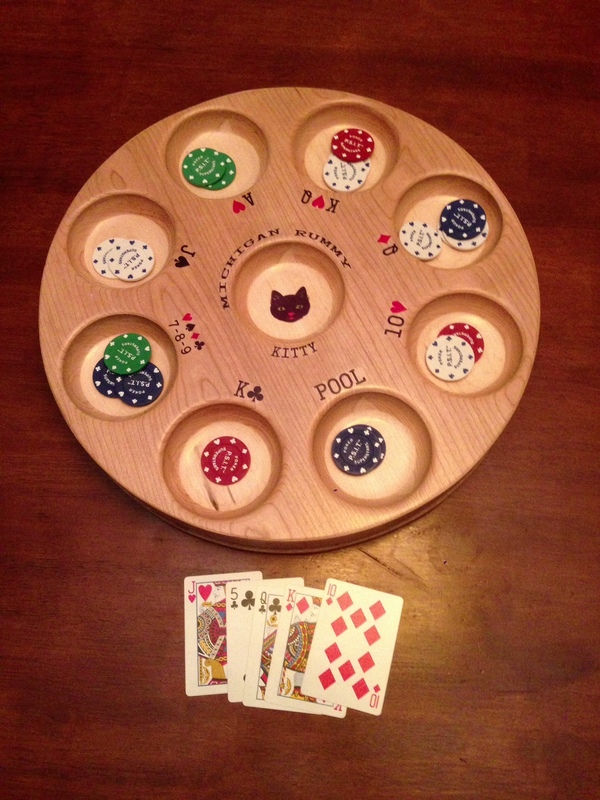 Do you sell these Michigan Rummy Boards?